During colonial times, John and Anna settle in an Ohio village to become Moravian missionaries to the Lenape. When John is called away two days before Christmas to help at another settlement, he promises he’ll be back by Christmas Day. When he doesn’t show up, Anna works hard to not fear the worst while she provides her children with a traditional Moravian Christmas. Anna Brunner kneaded dough while she tried not to notice it was almost dusk. Her husband still wasn’t home. She wiped her hands on her apron and glanced out the six-pane window. The last glint of sunlight blazed the horizon gleaming on the dirt path. No trace of him. After scooping some sugar, she worked it into the dough and strove to reflect on the Christmas Eve Lovefeast and all the work she had ahead. She’d been honored with the mission of making the sweet buns and would be one of the Dieners serving the meal at their newly built church. It did no good to fret about what was going on at the meeting down the road. She’d find out soon enough. She released her anxiety on the dough as she squeezed her fingers through and pounded it into shape. After living in this village for over a year, celebrating the yuletide with all the fanfare it deserved would make up for everything. The children giggled as they finished a game of jackstraws. Belinda, eight years old, failed to remove a straw without touching the others, and Lisel, the round faced six-year-old, smirked as she shouted out in triumph. Three-year-old Katrina’s brown curls bounced as she clapped for Lisel. She hadn’t managed to win any rounds, but Belinda insisted they let her play until a winner had been declared. “Let’s get the tree ready,” Belinda said. The girls threw the wheat straws in a basket and dashed to the wooden pyramid frame their father had built. Large boughs were stacked in the corner of the room. Earlier today, before John was beckoned, he’d cut them from the pine trees that lined God’s Acre, the village cemetery. Moravians didn’t cut down trees and drag them into houses the way some did. By using the frame built from wood, and boughs cut from limbs, they still managed to build a nice Christmas tree. Once all the limbs were in place, the girls would decorate it with pieces of paper with Scripture verses written on them, and pure white beeswax candles with red ribbons tied around them to represent Jesus, the light of the world, who shed his blood on the cross. Anna’s thoughts drifted to when her husband announced his decision to move to the Ohio wilderness. She had been livid. Many Lenni Lenape were forced to move west, but that didn’t mean the missionaries from the Moravian Church needed to follow those Delaware Indians, at least, not the missionaries with families. There were still plenty of natives in Pennsylvania. For days, she’d tried to change his mind by pointing out they didn’t need to leave their family and friends in Bethlehem to serve God. He promised her they’d be safe, that the girls would be protected, but she told him he should stop making promises he couldn’t keep. “We have our duty as missionaries to the natives.” His voice was calm as if his statement settled the matter. “I won’t go.” The declaration had shocked her as much as it did her husband. Anna glanced out the window. Dark clouds had blown in obscuring the rising full moon. John should have been home eating his supper by now. Earlier, she’d arrived from walking the girls home from school to find John huddled around the fire in discussion with Brother Luke, a village elder. Luke had been a Moravian for so long, she sometimes forgot he was Lenape. “We can’t let him face them by himself.” John’s furrowed brow wrinkled his normally pleasant face. When Anna closed the door, the conversation abruptly stopped. John had grabbed his coat and kissed her on the cheek. “I don’t know, but it’ll be in time to sup with you and the children. I promise.” He closed the door behind him before she could say more. That was four hours ago. Anna reached down and gave Lisel a hug. “Soon, child. Help Belinda and Katrina with the tree.” She grabbed the copper ladle hanging on the wall next to the fireplace and stirred the stew she kept warm on the embers. The aroma of pieces of roast pig, overdone potatoes, and turnips made her stomach rumble. If he took much longer, she’d feed the children without him. She remembered the astonishment in John’s eyes when she had told him she was staying in Bethlehem. He didn’t say anything, didn’t chide her, or tell her she was a disobedient wife. He wrapped his arms around her and kissed her forehead. She quivered under his touch. A lump formed in her throat, and before he released her, tears rolled down her cheeks. What choice did she have? So they set off with a group of twenty-eight Moravians, both white man and native, to settle the wilderness and preach the Gospel to the Lenape. Anna hadn’t felt safe since. She punched the dough and set it on the bread board to rise. Since they moved to Schoenbrunn Village, most Lenape welcomed the Moravians, but some looked upon them with suspicion even though most of the families in the group were natives. Then there were the Iroquois, Wyandot, and Shawnee, all warrior tribes leery of the settlers, and some of them hostile towards Lenape. Looking out the window, she couldn’t see anyone coming down the path, only shadows of other cabins. She grabbed the flintlock on the mantle and lit the candles so they could see to eat their supper. There’d even been an incident in Gnadenhutten, their sister village to the south, of some Wyandot marauding homes and stealing supplies. They didn’t hurt anyone, but they might next time. Or they might decide to pillage Schoenbrunn Village. She rubbed her belly, hidden by the light blue apron that protected her blue and white striped wool dress. She’d sewn it last winter out of the material she’d bought before they left Pennsylvania. New life growing inside helped keep her mind off the dangers. Maybe next year she could give John a son. That would make things the way they used to be. She would tell him the news on Christmas Day. She set tin plates on the wooden table next to the wall where the children had decorated the tree. Many of the preparations for the celebration were already done. The tree took up too much space in their small cabin, but it was worth it. They still had room for the rocking chair perched by the fireplace. John had made it for Anna last Christmas. Baskets, water carriers, a spinning wheel, and various other tools were hidden away on shelves in the corner to provide more room. A straw tick where the children slept was tucked under the rope bed. Lisel reached up as far as she could to attach a bough to a higher wooden beam. Katrina only managed to reach the lower planks. Belinda moved the papers and ink bottle from the table where she’d been writing out Scriptures to hang on the branches. The door flew open, and the burst of frigid air chilled the room and blew out one of the candles. John stepped inside with a recent Lenape convert who had been baptized under the name Paul. Anna was glad the man had converted. Brother Paul was six feet tall and built like a tree. Her husband was almost as tall and as broad across the shoulders, with a pleasant look that seemed to want to break into a smile at the slightest provocation. John’s strength helped her feel safe, as if being wrapped in a warm blanket. Even though she’d lived among Lenape most of her life, Brother Paul scared her. Belinda and Lisel ran to their father and gave him a tight embrace. Katrina tugged on his trouser leg until he picked her up and ran a hand through her brown ringlets. Katrina was the only one of their children who favored Anna. John hugged his oldest girl. “You’re such a blessing to your mama.” He said the words in English, which was odd. They spoke Lenape when natives were around, especially ones who hadn’t learned English. John would normally remind the girls to speak Lenape when they had a guest. “I helped, too.” Lisel allowed her lower lip to almost reach her chin. “I help Mama,” Katrina said. “Of course, you do.” John set Katrina on the dirt floor. 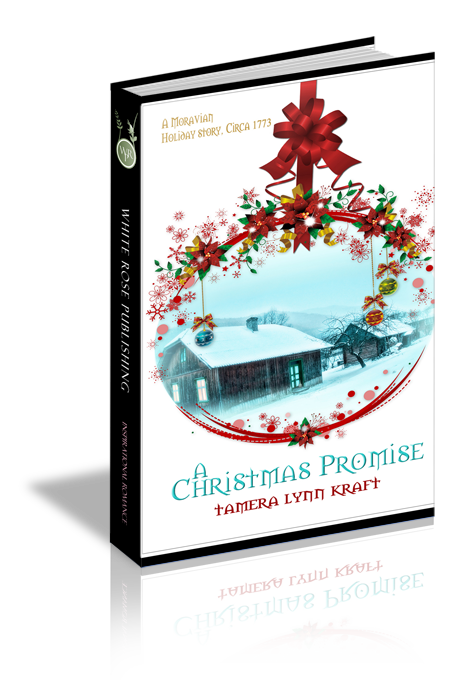 Lisel clapped her hands together, and the girls gathered near the blazing fire where pinecones, cloth, and papers lay in a wicker basket. The children would make figures out of them depicting the Nativity, the wise men, and the Exodus from Egypt. John had already whittled a small manger. Katrina, as the youngest, would place the pinecone baby Jesus in it on Christmas Eve after the Lovefeast. Brother Paul shook his head. He wore a grey shirt and trousers, a buckskin coat similar to her husband’s, and had shaved his Mohawk. But when he crossed his arms and leaned against the door post, he looked as intimidating as when he wore black and red paint around his eyes, and dressed like a warrior. Her shoulders relaxed. Luke had been a trusted native helper to the Moravians since his youth. They’d known him for years in Pennsylvania. But Paul showed up at the village a few months ago. Anna wiped away the stray tear rolling down her cheek. “May the Lamb that was slain receive the reward of His suffering.” She said the words in Lenape to reassure him, but they didn’t make her feel any better. The door made a thumping sound as Paul closed it on the way out. The girls ran to their father and hugged him. “When will you be back?” Belinda asked. John took Anna into his arms once again and kissed her. The heat of the moment swept through her as she leaned into the kiss with parted lips. He rested his mouth against her neck, and then pulled away. After strapping on his supplies and musket, he opened the door. The blast of winter filled the cabin and sent a chill through her. She scampered to the fireplace, grabbed her ladle, and dished stew onto tin plates. “Children, come to the table to sup.” The door shut with a dull thud behind her. Question 1: The Moravians had a number of traditions to celebrate Christmas. What traditions do you and your family observe? Why are these traditions important to you? Question 2: Anna didn’t want to go to Ohio as a missionary to the Lenape, but she went anyway. Has God ever directed you to do something you didn’t want to do? How did it turn out? Question 3: John didn’t tell Anna the whole truth about the dangers involved with his trip. How could he have handled the situation better? Question 4: Anna let worry consume her thoughts. What things do you worry about? What does the Bible say about worry? Question 5: Anna decided to help handle her anxious thoughts by helping Rebecca? What things have you planned to help others, this Christmas? Question 6: As Belinda read promises from the Bible that she hung on the tree, Anna was comforted. What promises has God made you through Bible verses?